Mark Chavez, a Singapore based artist, animator, writer, director and assistant professor at Nanyang Technological University has hit the bull’s eye with a Vengeance!!! 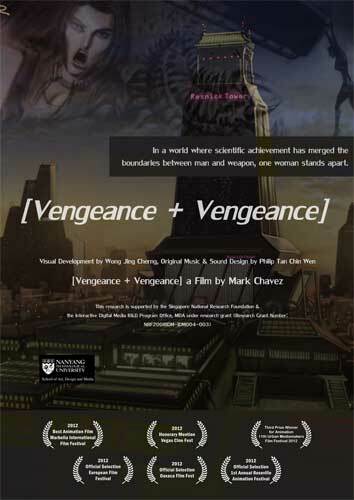 His CGI animated action film Vengance+Vengance has recently won the Best Animation Film Award at the Marbella International Film Festival 2012 along the Costa del Sol in Puerto Banús. The film also premiered in Las Vegas at the Vegas Cine Fest where it received an Honorable Mention and received a third place award from the Urban Mediamakers International Film Festival 2012 in Atlanta, Georgia both in the U.S.A.
Vengance+Vengance an 18 minute film, is authored in a game engine, the Unreal Development Kit (UDK). It is part of a research project titled ‘Cinematics and Narratives: creating real-time visual toolsets (NRF2008IDM-IDM003)’. The film stars the vocal talents of Amelia Jaishree, Bob Feldman and Mark Chavez. 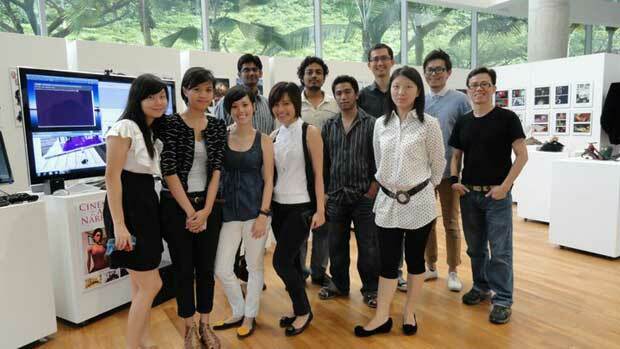 It was made at Nanyang Technological University’s School of Art, Design and Media through research funding provided by Interactive Digital Media R&D Project Office, Singapore. JC (Jing Cherng) Wong held the duty of visual development lead for the film while Music & Sound Design is done by Philip Tan (Chin Wen). 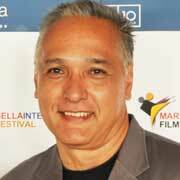 Mark Chavez is an assistant professor at NTU’s School of Art, Design and Media, Singapore. With 25 years of professional animation industry experience, he has worked as an animator on many different projects such as performance based laser animation for rock concerts and special venues, direction and execution as a lead artist for Alien Trilogy, a PlayStation 2 game (the first PS2 game to use motion capture), has done CGI motion graphics, storyboard, design and execution for television commercials and Japanese game shows at Tokyo Broadcasting System (TBS), feature animation and effects at DreamWorks and live action visual effects for Rhythm and Hues Studios, Los Angeles. “With the help of JC Wong an experienced comic book and storyboard artist; Boon Yi Fei my lead rigger; software leads Hakhyun (Harry) Kim, Aung Sithu Kyaw and Thet Naing Swe, the project took it’s present form. It was staffed with an inexperienced crew of former students who had recently completed studies in animation at the School of Art, Design and Media at Nanyang Technological University, Singapore. I had been their instructor while they were studying in their undergraduate cgi and storyboard classes and then as a director on this project. This research project was done after the completion of their school studies and for many was their first experience in the job market. Although Singapore has a burgeoning film industry none of these former students had seen what the fruit of their efforts could bring. Now that the film has won a few awards and has promise to go further, I hope that we will come to better understand what we made.”he concluded.